Calling card for Mr. and Mrs. Amos Clift, Jr. Hannah Morse was the maiden name for Mrs. Clift. 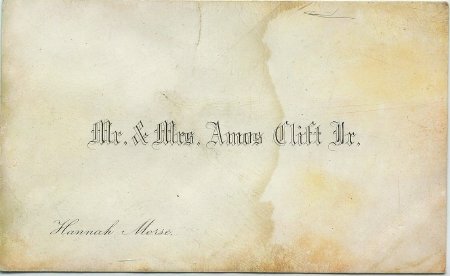 The envelope with the card has a note that this is the way that marriages were announed in the 1800s. They were the grandparents of Alla L. Allyn who originally had these items.